Unsurprisingly perhaps, a Nic Sparks adaptation has made it onto my list. Allie (Rachel McAdams) and Noah (Ryan Gosling) fall in love but, as life threatens to tear them apart, is their relationship strong enough to survive? Beautiful scenery, kisses in the rain, heartbreak and romance. Perfect. The iconic final scene (and song) isn't the only reason why An Officer And A Gentleman is on my list. I love this film more for Paula (Debra Winger)'s growing love for Zack (Richard Gere). The desperation she feels at the thought of losing him gets me every time. The second film in Richard Linklater's superb Before trilogy takes place nine years after Celine and Jesse's first meeting. The pair walk the streets and talk about their lives and what happened after Vienna. spend the few precious hours before sunrise getting to know each other and falling in love. Before Sunrise is smart, authentic, charming and wonderfully romantic. More than enough to melt the most cynical of hearts. 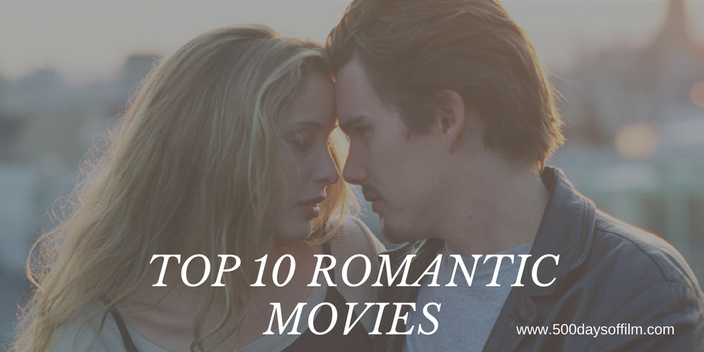 What do you think of my list of romantic films? What would you add or, even, remove from this group? Very pleasantly surprised that the first movie I see on your list is Wall-E. Wouldn't make my top 10, but a very inspired choice. I am extremely happy to see Eternal Sunshine of the Spotless Mind make the cut. That probably would make my top 10. I still need to see the "Before" movies. Thanks for stopping by! You are, of course, absolutely right... these three films are worthy of any list - particularly A Matter Of Life And Death. I love that film and watch it on a regular basis. In fact, it feels high time for another viewing. Thanks!